Even if you only have a small side hustle to supplement your income, you need a plan. I don’t subscribe to the “grow or die” attitude, but I do subscribe to the “always have a plan” attitude! In this blog post I will talk about my processes with regards to keeping on track with my business plan and how you might be able to use it in yours if you’re also on the journey of a solo entrepreneur. 1 Do you write reports? Each week I write a quick report on how last week went. It doesn’t contain any numbers such as revenue, it’s about the actions taken and work completed. I find writing down the positives and negatives helps me channel my energy for the week ahead. It’s a tactic I use to try and keep me going forward on the right path. The method of writing a weekly report isn’t something I’ve ever read in a business book, or blog post, or been told about or taught. It’s an idea I had once and decided to try. Now it’s something I do regularly. Do you write reports on how your business is going? You should try it. It’s beneficial to keep track of how things are going. If you don’t write reports then down do you stay on the right path with your business? If you don’t use reports then I’d recommend trying them. Writing a report every week works perfectly for me. Depending on your business and what you do though it may not be a suitable timescale for you. Perhaps a monthly report would suit better. But you’ll have to decide that. I use Microsoft Word to do write the reports but you could use whatever software you want or hand-write them. Ultimately for me, the whole point of it in the bigger picture is to keep the business plan on the right path. I didn’t write a full two-year plan including all the finances and projections for it to be forgotten or ignored! For my weekly report I have a template. Each week I copy and paste that template and fill it in. It helps me create consistency and only focus on what matters. I’m not writing a diary after all! Keeping things concise is important. One of my sections asks “Have you re-read the full business plan this week to keep it fresh in the mind?”. I have to write in a simple yes or no answer and can also write one sentence if I have to give a reason why I haven’t read it (normally laziness!). If I go a few weeks not even glancing over my business plan then I get frustrated with myself. But what I find is it actually has a beneficial effect. Having been self-employed for over 10 years it amazes me how long it’s taken to work out what’s optimum for me. But I guess the phrase “some people never learn” exists for a reason. At least I’ve learnt eventually in this instance! If I read something too many times I become numb to it. It’s like it takes on insignificance. It’s almost like if I read a monthly target is to post 20 new blog posts, and I get behind on that target and keep seeing the target, in my mind I start to think, “Yeah yeah yeah whatever, I know it’s meant to be 20 new blog posts.” That’s especially true if it’s amongst other targets too. That’s why I’m actually finding it beneficial to glance at the business less-often. Ironically my laziness has led me to discover something. I’ve discovered the art of balancing out awareness of what has to be done without becoming immune to it. Regularly reading your business plan and writing reports as to whether you are on track is a good thing. But reading your plan so often you become numb to it is definitely a bad thing. Find the right balance for you. Don’t read this article and do nothing about it. 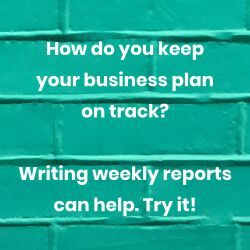 Decide for yourself; will doing a weekly or monthly report help keep my business plan on the right track? If it’s something that could help then I’d recommend doing a trial. Perhaps try it for 4 weeks. For example, if you want to do it every week then schedule to write your report on a Monday morning for the next 4 weeks. Be sure to create a template so that each week is consistent and it’ll help you be concise. Have I re-read my business plan for freshness this week? Progress made to keep momentum? Are financial projections roughly on track for this month and is any immediate action required next week for cashflow reasons? Did I complete all routine aspects of the business correctly? Any reactionary steps needed to events this week or current levels of activity? Those are some rough ideas. It’ll be entirely dependant on what your company does and how you go about your day-to-day running. An e-commerce site will be quite different from someone with a side hustle trying to make an extra £100 per week. They are the sort of questions I ask myself each week to keep me on track with my operations and can hopefully get you started no matter your niche. I hope this article helps. Thanks for reading. If it’s helped please check out the rest of the MoneyCortex personal finance blog for more content that may also be of use to you.